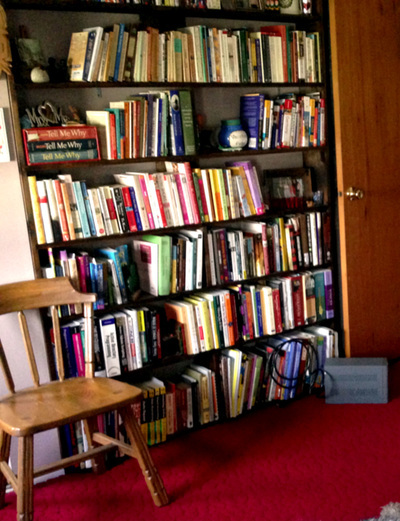 To put it simply, Eileen has more books than anyone I’ve ever known – books from her childhood, books from college, books of poetry – some she’s read and some she just likes to collect. But long story short, she was running out of room storing them on a wobbly old shelf – in double rows, and then there were the boxes in the closet. Eileen kept telling me that she had the perfect spot for a built-in shelf, so I pulled out a Post-It note and sketched out a basic design with measurements. 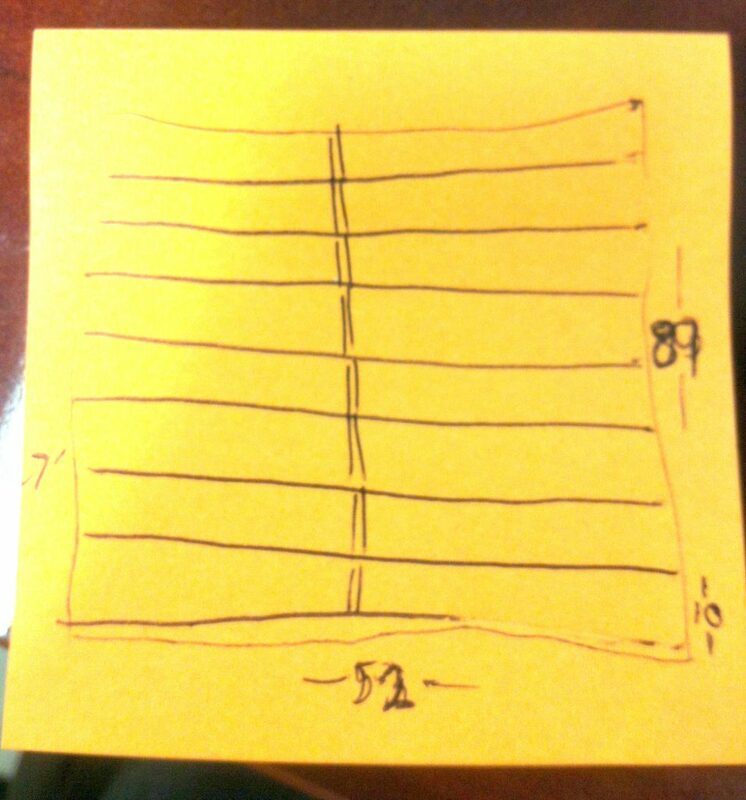 First, I planned out all the cuts I needed for the DIY bookshelf and put together shopping list for Home Depot. I wanted to make a very sturdy bookshelf with minimal visible hardware. So I opted for dado joints and a center support column. Also, I decided to use pine for the lumber. 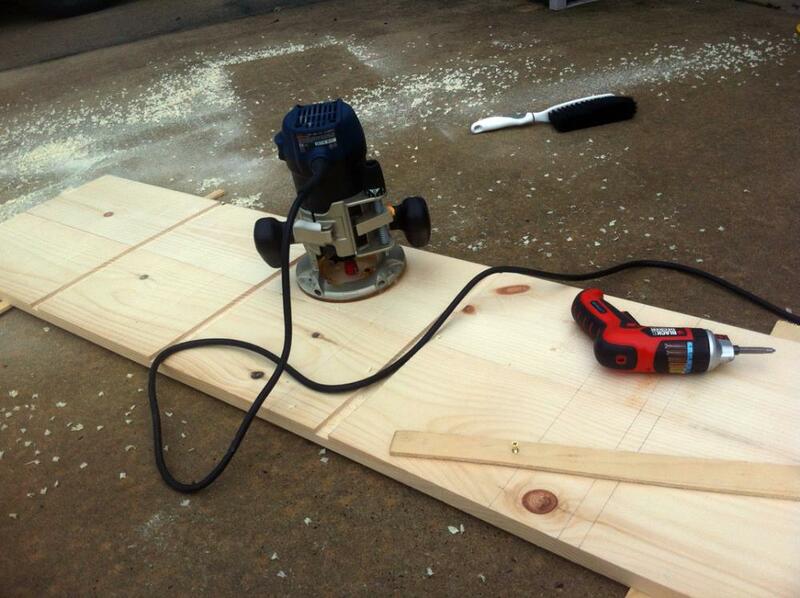 I did lack the proper tools for making dado joints, so I added a plunge router to the shopping list. This was going to be my first router project, and I was looking forward to it very much. After cutting all the wood planks to pre-measured lengths, the next step was to mark all the grooves for the dados. 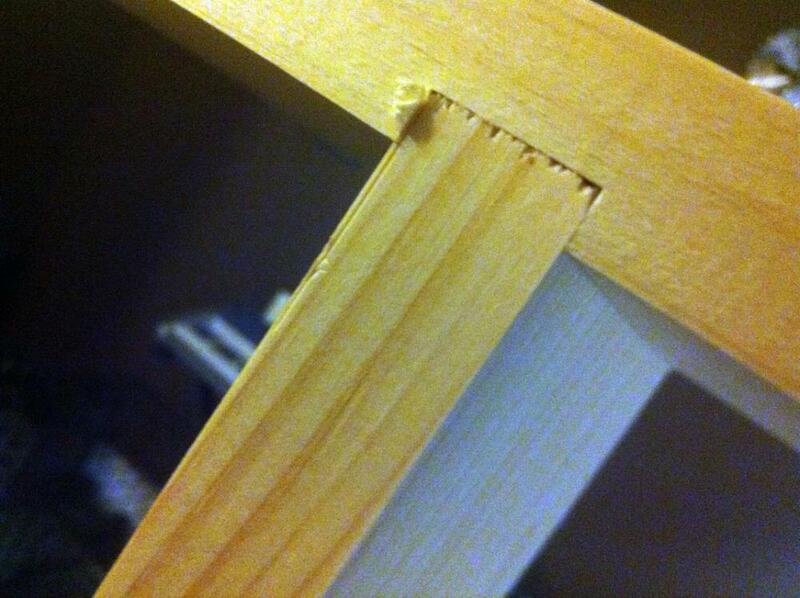 Dado joints are the simplest joints there are but are very strong and perfect for bookshelves. 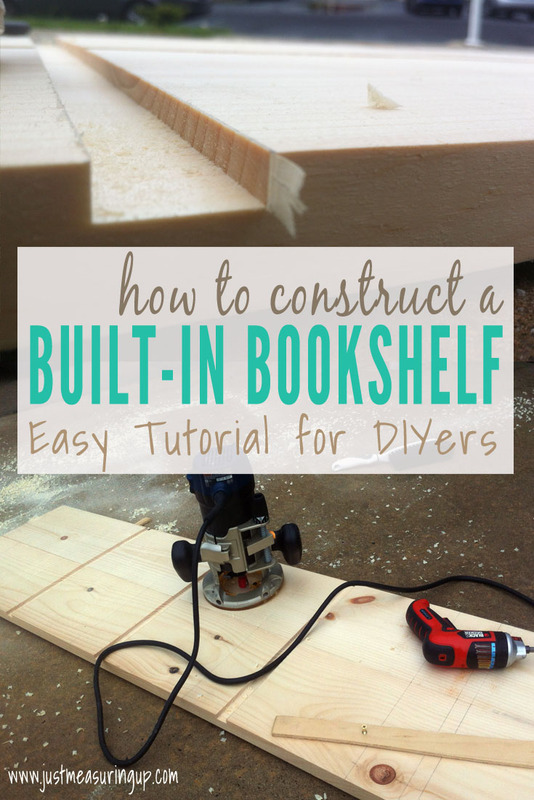 They are just grooves cut into the vertical support planks on both ends of the bookshelf, where the horizontal shelves slide right into and rest. My pine lumber was ¾” thick. So, I needed to use a router bit of the same thickness for the grooves. After the grooves were outlined on the two vertical support planks, I secured the planks side-by-side to prepare for the routing. The grooves on the two support planks needed to be in perfect alignment. 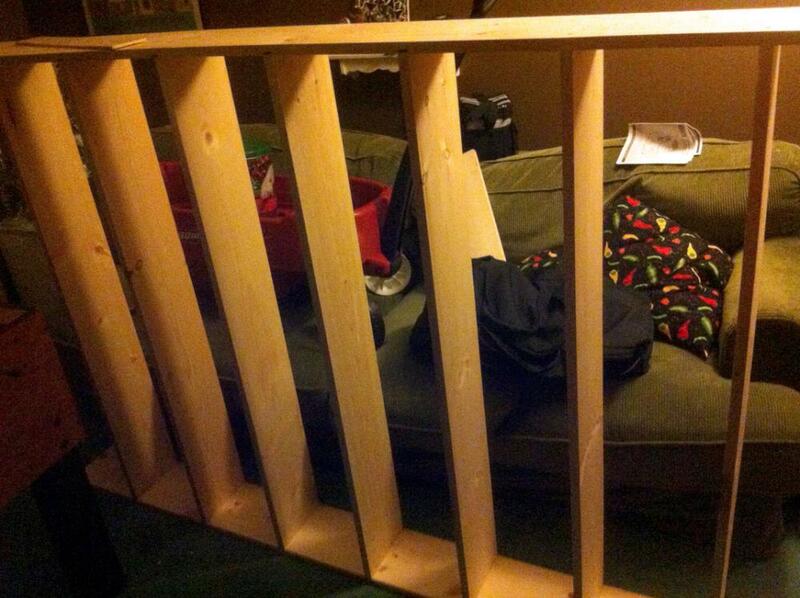 Therefore, I screwed the planks together from underneath with some strips of scrap wood. It was important to keep the planks firmly in place to prevent shifting as I cut the grooves. Finally it was time to use my plunge router. I did a few practice cuts on scrap wood to get the feel for it and was now ready for the real thing. For each groove, I affixed a straight piece of wood to act as a jig for the plunger. 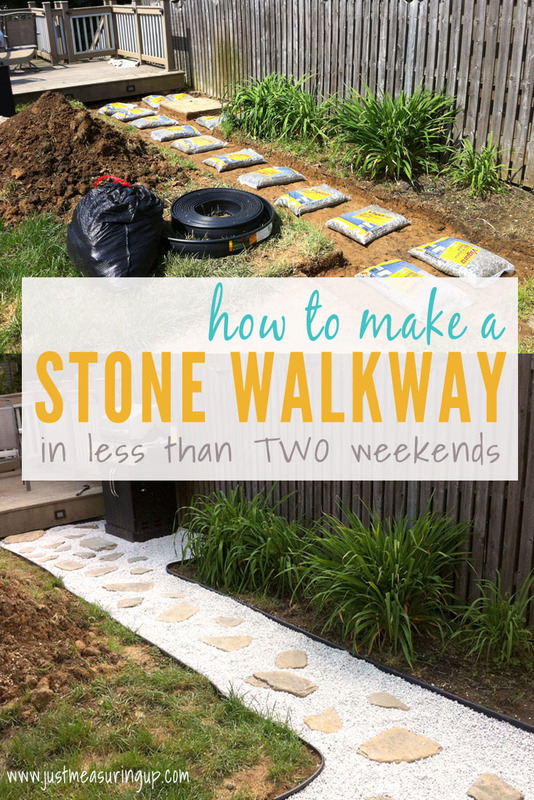 Without this guide, it would have been impossible to cut a straight line. 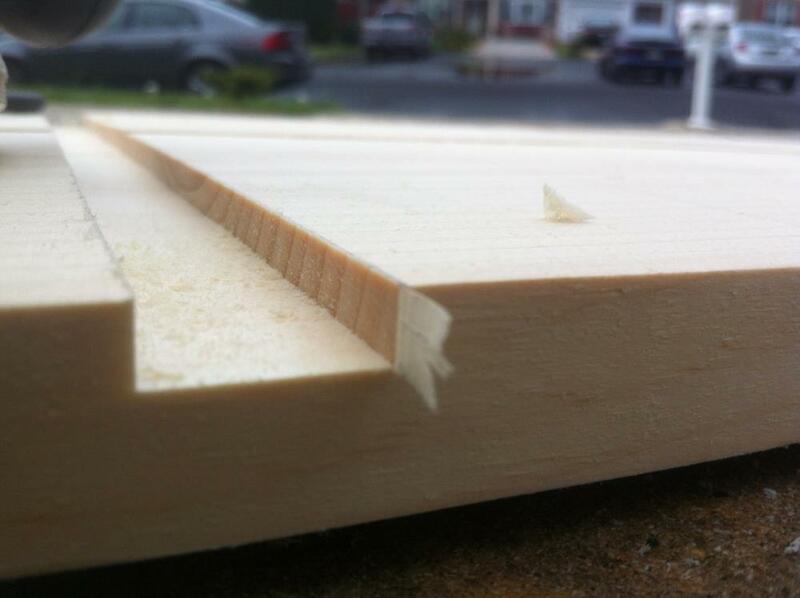 Below is a picture of the plunge router and some grooves already cut. Here’s a close-up view of the dado groove. You can see how smooth the cut was. With all the dados cut, assembly of the shelves could begin. With the help of a rubber mallet, I inserted each shelf into its corresponding dado joint and secured each connection with two screws on the outside. 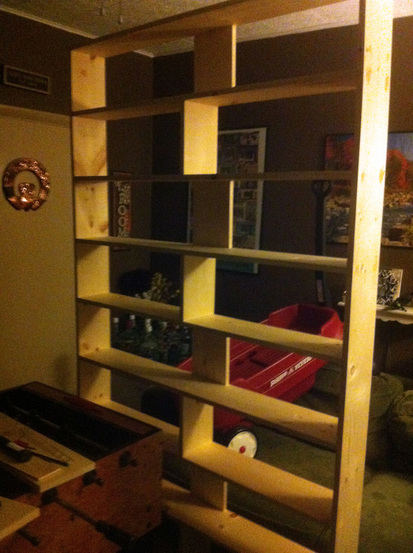 Here you can see how perfectly each shelf fit into the dado: Assembly of the shelves was almost done at this point. Next came the center support column. As you can see in the background, I did my work in my man cave. We didn’t have a garage to work in – hence the chaotic background and poor lighting. 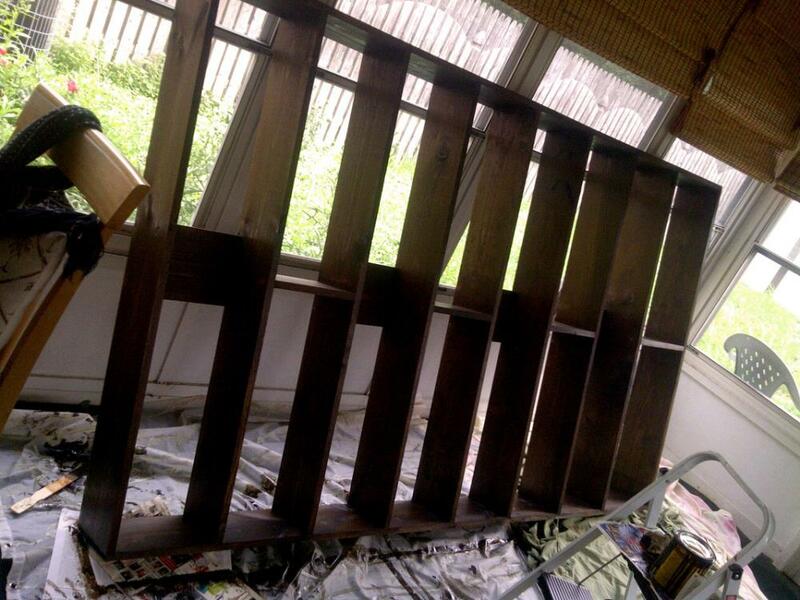 Construction of the DIY bookshelf was completed at this point. All that was left was to fill the screw holes with wood putty and apply a wood stain. Eileen stained the wood with two coats of a dark MinWax stain. The final step was to secure the bookshelf to the wall in the office. I used some metal L brackets to attach a few shelves to studs in the wall. I strategically placing them so they would be hidden from view. Also, I had to remove some of the wall baseboard trim so that the shelf could fit flush against the wall. 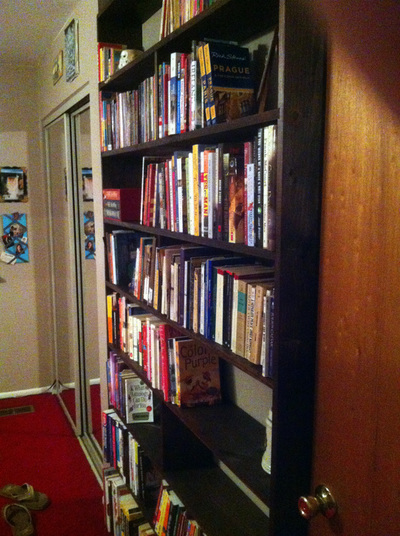 Below are pictures of bookshelf bolted securely to the wall. I wasn’t too happy about the electrical outlet at the bottom left being partially blocked by a shelf. However, it was too late to do much about it now. The outlet wouldn’t be visible anyway because of the books. There was no sagging at all with the weight of the books. 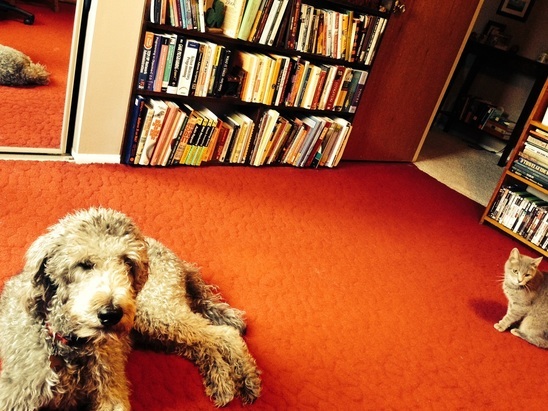 Eileen finally had her library organized on this built-in DIY bookshelf. I use the word ‘library’ because who else has enough books to make an Irish Classics section?! Years later, the shelves remained perfectly straight, thanks to the dado joints and center support column. Fast forward a few years, in our new house, I made another DIY bookshelf – a bookshelf with a window seat, using the background I had from designing this shelf. 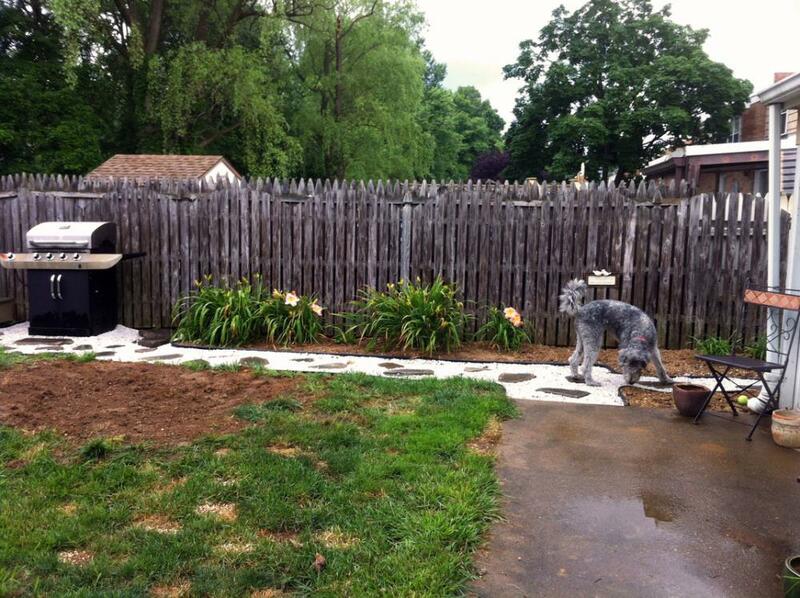 With a larger house comes a bigger yard. I knew my little push lawn mower could only do so much with half an acre. This was proven true after nearly 3 hours mowing the grass, and stopping to empty the bag every 2 minutes. Because of this, I bought a used riding mower that sped things up significantly, as I can now finish cutting the lawn in just over half an hour. However, the behemoth was taking up half our garage. I had big plans for our new garage, and as much as I loved my new riding mower, its home was not going to be the garage. 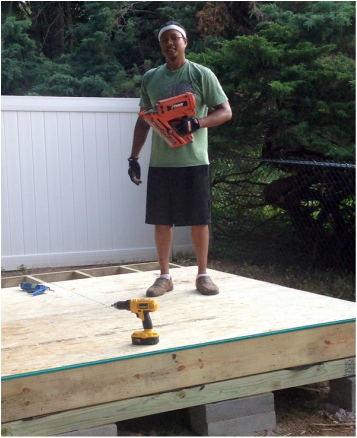 This was an excellent opportunity to work on my dream shed project – teaching myself how to build a storage shed. I worked on building the DIY storage shed single-handedly over the summer. I wasn’t sure that building a shed was in my skill set, but I did a lot of research, watched a lot of videos, and asked some contractor gurus for advice. An amazing DIY storage shed that my wife still can’t believe I built. 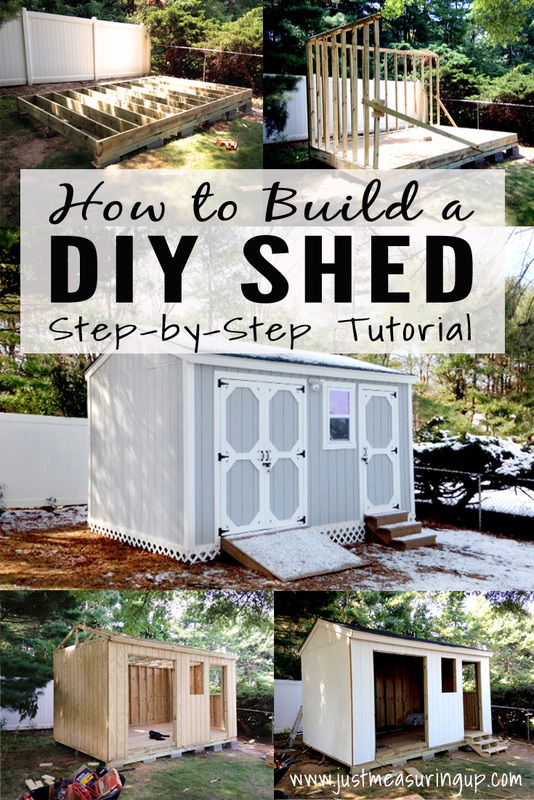 If you are wondering how to build a storage shed or if building a shed from scratch is within your skill set, keep reading this DIY shed tutorial. I’m breaking it into two posts because of the amount of details. 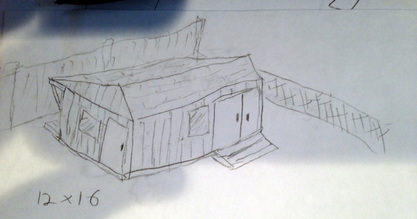 In learning how to build a storage shed, the first thing I had to do was decide on a shed design and plans. Now if I was going to build a shed, I wanted it to be multi-functional and not just mower storage. I went over several ideas in my head about how I could use the new storage in the shed. I initially thought it would be nice to have an area of the DIY shed to store bagged lawn clippings and keep it dry from the rain. It was annoying trying to handle soaking wet yard waste bags once exposed to the elements all week. I also wanted to remove some of the bulkier items from the garage (like the wheelbarrow and fertilizer spreader), so the storage shed needed to be large enough to accommodate these things. After taking measurements of the riding mower, I padded the size to include additional storage. I settled on a 10 x 16 shed plan. 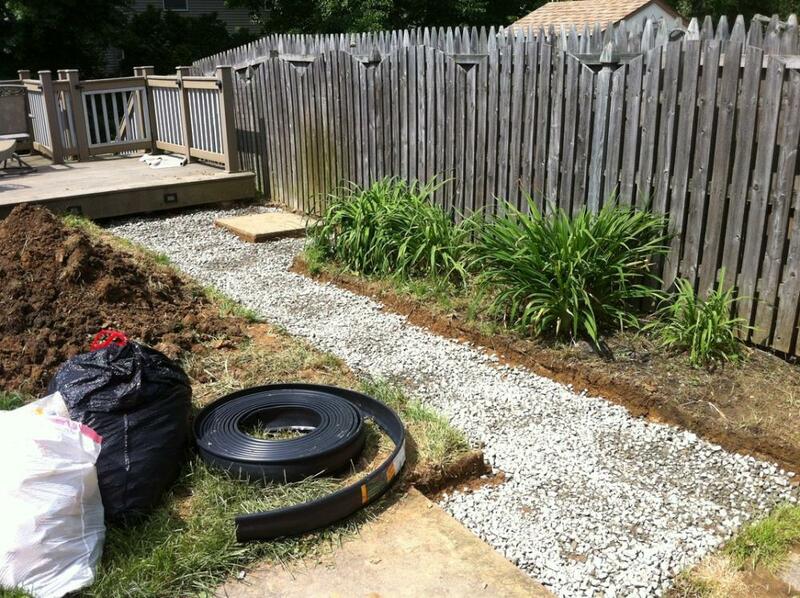 This would give me ample space to park the mower and store gardening equipment and large tools. When planning things out, I usually like picturing the end product and doing a walk-through in my head to make sure everything makes practical sense. I envisioned myself driving the mower into the storage shed, stepping off to the left (bagging chute was on the right), and walking out the shed door. I knew I wanted the mower entrance to be on the far end, and shed storage directly adjacent. Now if I stepped off to the left of the mower, I didn’t want to be walking into a wall. I thought it would be a tight squeeze to fit between the mower and the wall, so I wanted to place the mower entrance on the right size of the shed. With the basic requirements of how to build a storage shed in mind, I started shopping online for storage shed plans. There are lots of sites online selling plans for custom built storage sheds. I ended up going with www.icreatables.com. They had designs more to my personal liking, and they also had a ton of resources (video walk-throughs of storage shed constructions). I found a “Cape Cod” shed design that I liked a lot. 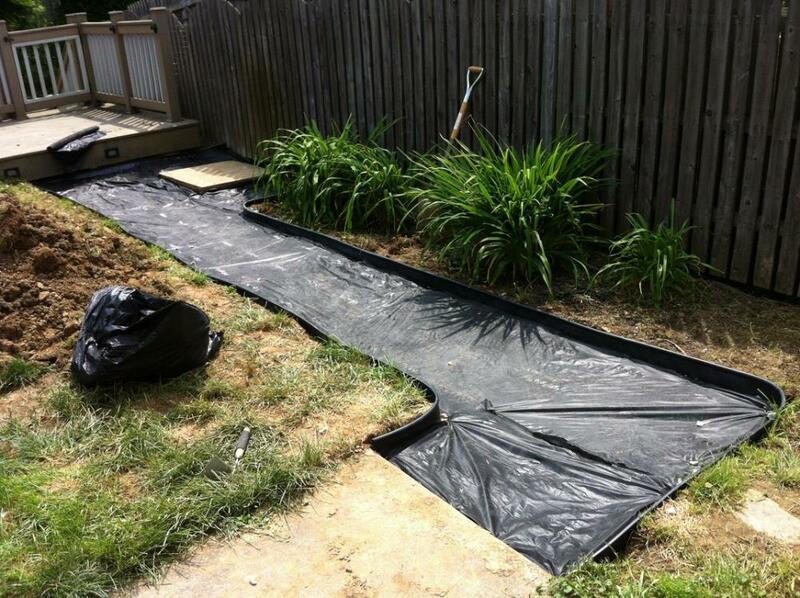 It came with a large overhang that would be perfect for keeping rain out of my bagged yard waste. As you can see in the picture, I have the mower entrance on the far right, and a porch on the rear for storing bags of lawn clippings. I also added a smaller door on the side of the shed to easily access the storage area of the shed. Two windows were sufficient to let in enough lighting. 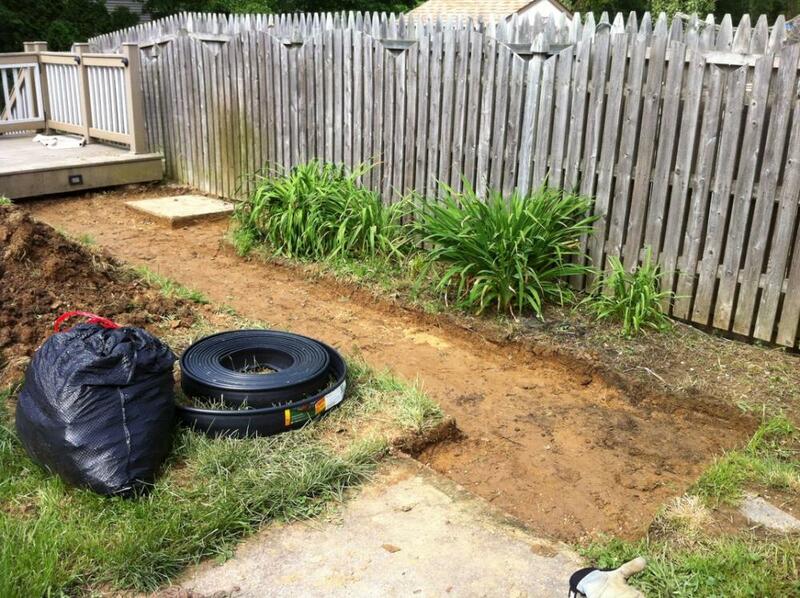 I also factored in a ramp for the mower. Don’t let the 12 x 16 dimensions fool you. 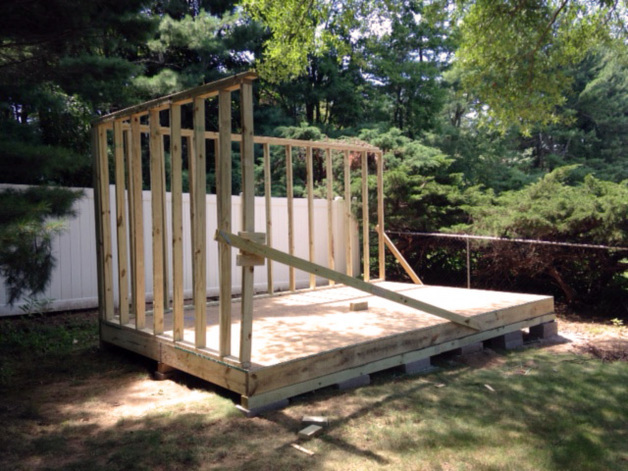 The extra two feet was accounting for the overhang, so the storage shed plan was still 10 x 16. 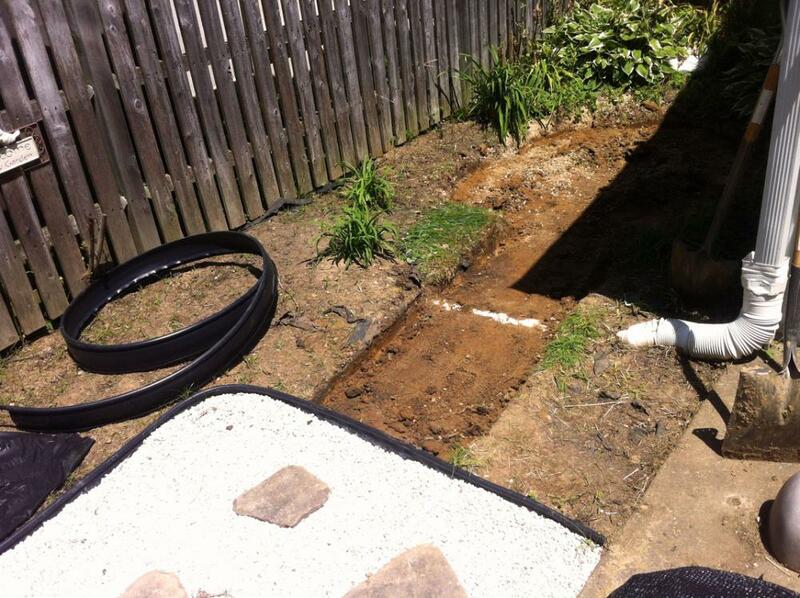 The shed foundation was going to rest on some 4 x 4 skids, sitting on 18 concrete blocks. 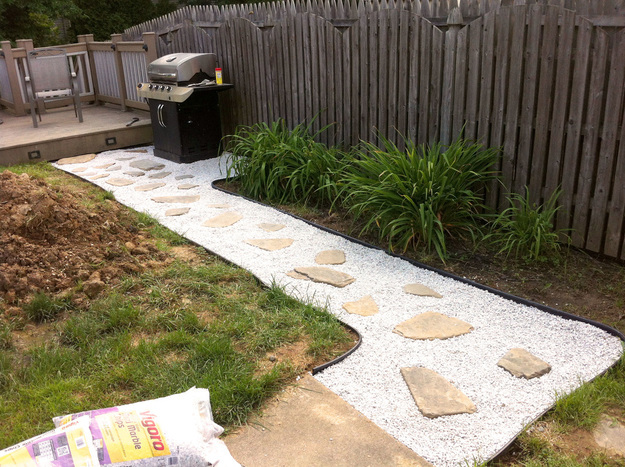 I did look into concrete anchors, but opted for the skid design due to simplicity. Also a majority of comparable storage sheds in my area were resting on skids, so that gave me confidence that I was making the right decision. I knew I was not in a flood zone either. If this were the case, I would have had to anchor the DIY shed permanently. I purchased the storage shed plans for $15 and started going over the material list and putting together a cost estimate. Moving on to the construction part of how to build a shed – this part of the storage shed construction took quite some time as I had no experience in construction of this magnitude. I had to google lots of techniques and terminology while going through the storage shed plans. Also I can’t tell you how much of a resource youtube was for me. 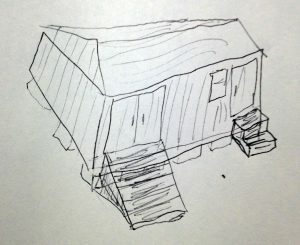 With each part of the shed construction process in the plans, I had to picture myself actually doing the work to know if it was within my skill set and if I had the correct equipment. I did have to purchase a number of tools to complete the shed project, but I’ll get to those in a bit. After mulling over the storage shed plans and materials, I hit a snag. To accomplish the two feet roof overhang, I needed a 16ft LVL (laminated veneer lumber) beam. This is essentially a really strong, hard, and heavy piece of wood running across the underside of the overhang. It needed to be strong enough to handle the weight of the shed’s roof. Unfortunately, the storage shed plans called for a certain size LVL beam that was really expensive for me and was not available at the local Home Depot. I considered making my own beam, but abandoned this idea out of lack of experience. The last thing I wanted to do was make something unsafe. At this point, I was also getting a little overwhelmed at the construction design of the overhang. This was a turning point in my shed project. So teaching myself how to build a storage shed, I ended up abandoning the overhang design and opting for a more traditional shed. This meant ditching the storage of the yard waste bags. It wasn’t such a terrible loss. If I really wanted to, I could construct a box with a flap at the top to store the bags in. So, I browsed through more shed designs and bought a simpler one for another $15. That sketch needed a bit of explanation as it does look a lot different than my original idea and went against my initial plan of the mower entrance being on the far right. At this point in the shed project, I had already started doing some of the prep work outside that was not going to change, regardless of the shed design. 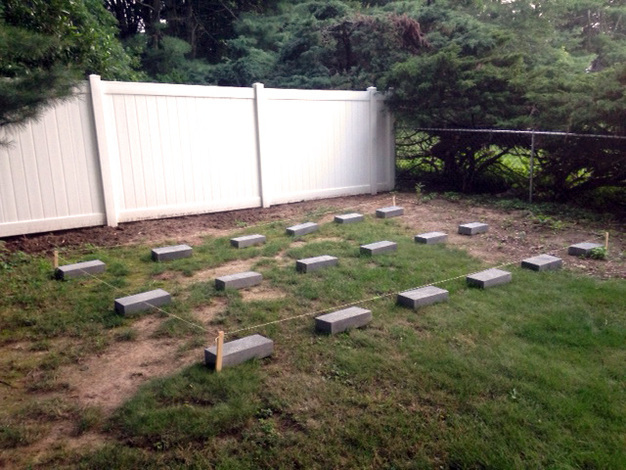 Specifically, I laid out the 18 concrete blocks for the skids and worked on getting them leveled properly for the storage shed (see pictures below). 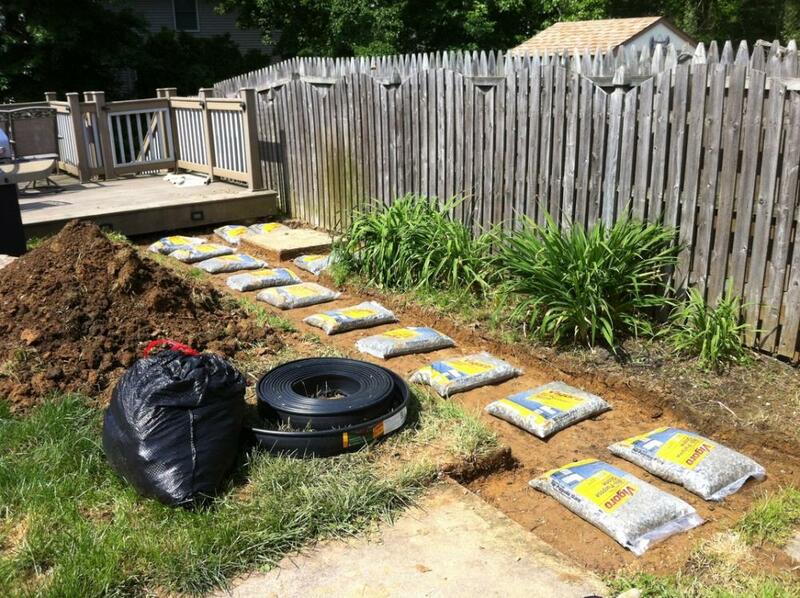 Here’s a small tip about leveling the skids for a storage shed. Even though I tried my best to get the concrete blocks perfectly level, there were a few that were off by a little. This left a gap when the skids were rested on them. So to fill the gaps, I used scraps of roofing shingles. I read this shed tip online, and it helped me out a lot. 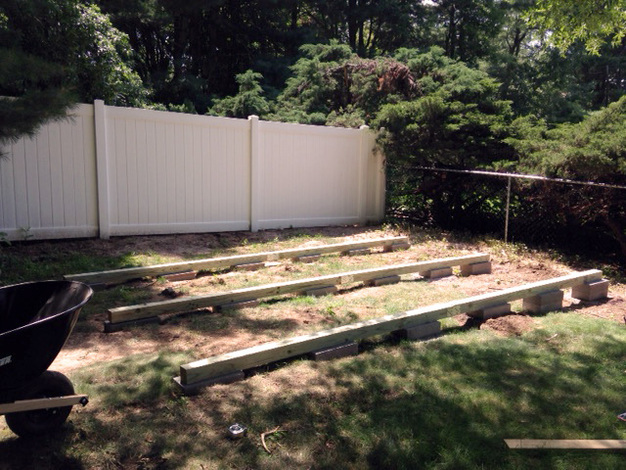 After leveling off the concrete blocks and placing the 4 x 4 skids on them, it became very apparent that as flat as the yard looked, there was a subtle slope that made the right side of the shed about a foot higher off the ground than the left side. This made it very inconvenient to have the shed ramp on the right side. It meant I would need a much bigger ramp (more materials and expense). Also, that extra foot of height was making me nervous about driving the mower up it. How simple it would be to just have the ramp on the left side of the storage shed, where the ground height was minimal. So, in my DIY shed design, I relocated the mower entrance. I did some more measurements and decided that the squeeze between the mower and the wall (when exiting the mower on the left) would not be so bad. Nonetheless, I still kept my fingers crossed it would work out. Also, I had to relocate the storage shed entrance door since that was where the mower was going to park. I did have to add some steps into my shed design to accommodate the big drop from the door to the ground now. Additionally, I moved the windows around in my shed plans. The windows are on the front right corner now. It all worked out for the best as this was the optimal setup to allow the most sunlight in. My yard has lots of big trees, and most of the storage shed is usually under tree shade. As you can tell in the picture with the 4 x 4 skids, I get the most sunlight from the right side of the shed so relocating the windows to the right made the most sense. Happy with the new design, I was excited to my DIY shed project – as I was making some good progress constructing the storage shed. 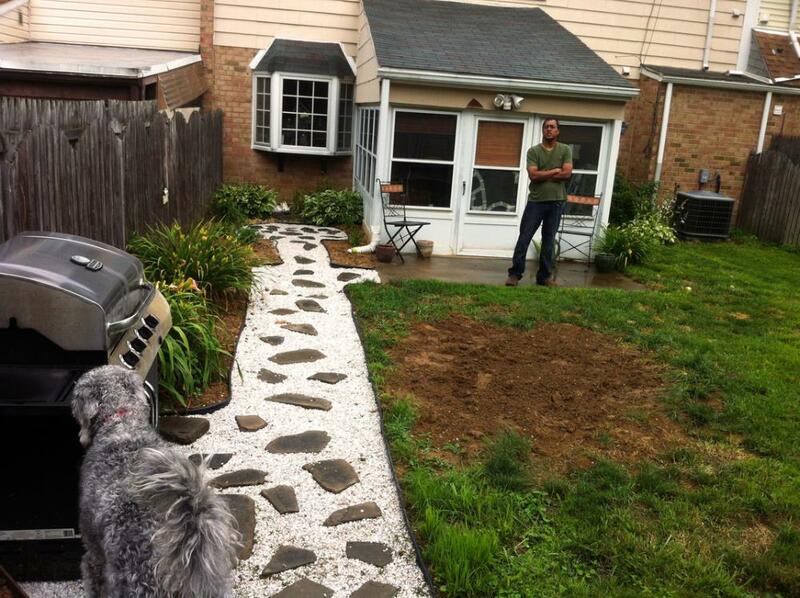 One of the most exciting and anticipated moments in the project was getting the Home Depot delivery of materials. For $75 delivery fee, Home Depot dropped off a gigantic pile of lumber for the storage shed on my driveway. With my wife’s help, it only took a couple of hours to relocate the lumber into my garage to keep it save from the weather. It was also very fitting that it happened to be our 5th year wedding anniversary, and wood is the appointed gift for 5 years! So happy anniversary my dear – wood! Anyway, prior to ordering, I made a saved list called “Storage Shed” on Home Depot’s website, and added all the materials I needed. The total came to around $2000. I was able to knock off an extra $250 though, and here’s how: ebay has lots of 10% off coupons for Home Depot (up to $200 off). I’ve come to realize that these coupons are hard to get a hold of for free. They typically sell for around $35 on ebay. This was a bargain for me because that $35 that I would spend on the coupon would save me $200 off my storage shed cost. Incidentally, the day I was going to purchase the coupon on ebay, I checked my mailbox and saw a bright yellow letter from Home Depot. I knew instantly what it was – a 10% off coupon! What were the odds? We just moved into our new home a few months prior, and Home Depot sent us a coupon congratulating us on our move. Well, we saved another $35. If you aren’t as lucky as me, buy the coupon on ebay for your project, if it makes sense for your budget. For the other $50 I saved – I used ebay. I was able to purchase 2 gift cards on ebay worth $500 each, but selling for $475 each. 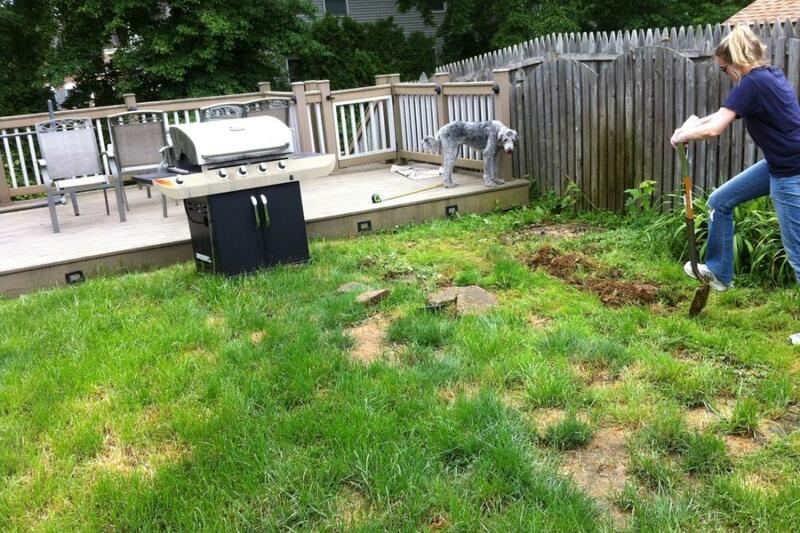 The next step in learning how to build a shed is to work on the shed foundation. I made the skids out of 6 pieces of 4 x 4 x 8 pressure-treated wood. Pretty much all wood used in the storage shed was pressure treated, by the way. The wood was treated with a special chemical to keep bugs (and moisture to some degree) out. When building outdoor structures, you really need pressure-treated wood. A word of caution though, be careful about splinters and sawdust from cutting. Splinters on the skin might sting or give a rash because of the chemicals. Also, wear a dust mask when cutting the wood. You don’t want to be inhaling chemically treated sawdust. For the storage shed skids, I needed each of the 3 rows to be 16 ft long, so I joined 2 of the 8 ft pieces with a mending plate. With the 4 x 4 skids now in place, I finally had a platform to start erecting the storage shed. 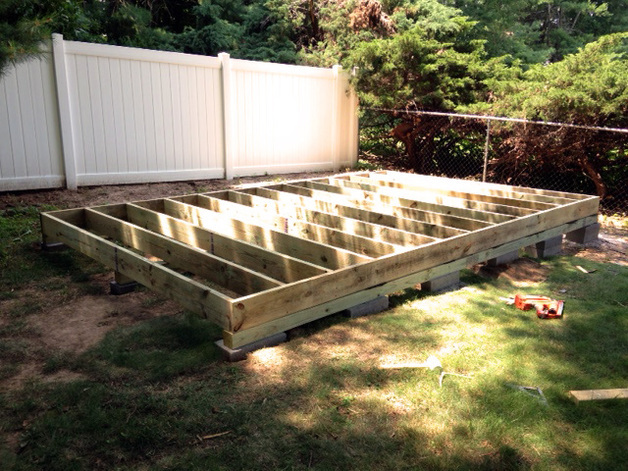 I followed the directions in the plans to frame the floor joists (see picture). Looks awesome, right? After framing the floor joists, I secured it to the 4 x 4 skids with some L brackets. Also, do you see my framing nail gun on the right hand side? I could not have built the shed without it. I highly recommend this type of tool for building large structures like this shed. The specific gun I have is a Paslode gas framing gun. I bought a used one on ebay for $100. They normally retail for several hundred dollars, so it was a great deal. I did have to buy a cleaning kit though because the nails were starting to jam after repeated use. Gas framing nail guns are the way to go if you don’t have a pneumatic compressor. They use a special butane fuel cell (a small cylindrical cartridge you insert into the back) and a rechargeable battery. The nail gun ignites some of the butane to fire a piston forward and drive the nail in. It’s really powerful (and dangerous if you’re not careful) and makes framing wooden structures a breeze. 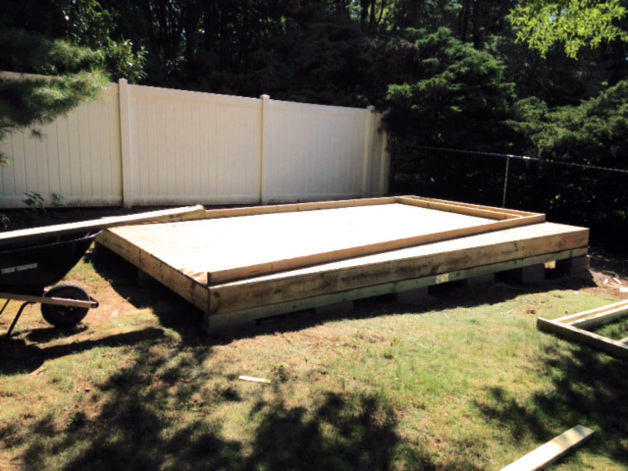 In learning how to build a storage shed, the next step was the actual floor. I used several 4 x 8 sheets of ¾” T&G orient strand board, following the sheeting patterns in the plans. The T&G stands for tongue and groove. One end of the board has a protruding strip called the tongue, while the other end of the board has a groove. The tongue of one sheet is meant to be inserted into the groove of the next sheet, interlocking them together. Once nailed down to the floor joists, the T&G system made a very sturdy floor for my shed. I also applied a deck finish to the floor to protect it from water. After securing the floor to the foundation, the next step was to frame and erect the walls. I followed the plans carefully and cut all the 2 x 4s to proper lengths. The large shed floor was a perfect platform to build the wall panels on (you can see I started assembling a wall in the last picture). After finishing a wall section, I stood it up, carefully aligned it with the edge of the floor, and nailed it into the floor joists. The 10 ft side panel went up first and was easy to raise and nail by myself. However, I needed some help raising the long 16 ft panel. It was very heavy and wobbly to work with by myself. Once in position, I secured it to the floor and then to the 10 ft panel already standing up. At this point, I thought it would be a good idea to use L brackets to more securely join the two wall panels. So I installed 5 brackets which held the panels very tightly in place. I repeated this technique for the rest of the panel installation. However, this idea backfired a little later in the project (I’ll get to that when I tell you about installing the exterior siding). The L brackets were a good idea, but unfortunately not this early in the project. I finished the panel installation. I installed some temporary supports to the open end of the panels to give some rigidity until more panels were installed (see picture). The two remaining wall panels took me more time to build, as they were more complicated in design. They had openings for windows and doors, which meant building and installing headers. Remember how I had purchased 2 separate plans in the beginning of the project? It actually worked well for me. The second plan (which I was basing my shed off) did not include any windows or a small door frame. However, the first plan (with the overhanging roof) had both of those things. So I merged the plans to create what I had in mind for my shed. 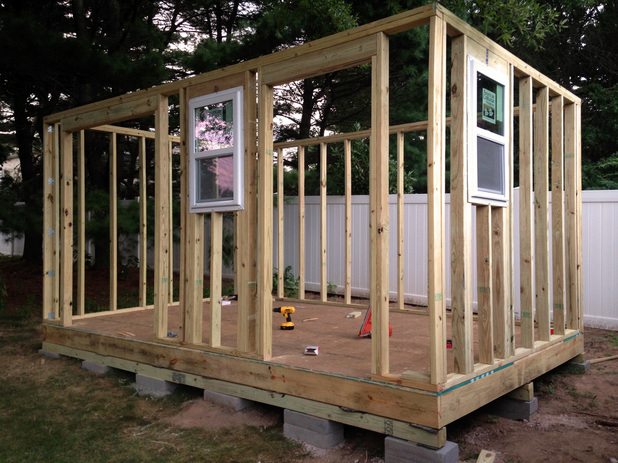 ​Next up in my how to build a storage shed project was installing the door and window headers. During the constructions of the wall panels, I had to install headers above each door and window opening. When you have a large opening in your wall frame, there is no vertical support there to help bear to load of the roof. So you have to install a strong beam above the opening to transfer the roof load horizontally and then down the sides of your opening. This beam is called a header. I built my own headers by nailing 3 layers of wood together. I sandwiched a strip of plywood between two pieces of 2 x 6 and it made a very strong beam. Here is the shed with all four wall panels up. Not bad for someone teaching himself how to build a storage shed. Ignore the windows that are mounted in the frame. I will install those later, but I was eager to see what they would look like mounted. I removed them shortly afterwards to continue construction. My shed project was really starting to take shape at this point. It looked like a professionally constructed building and I was thrilled! If you are wondering how to build a storage shed or if it is within your skill set, this tutorial will definitely set you on your way. 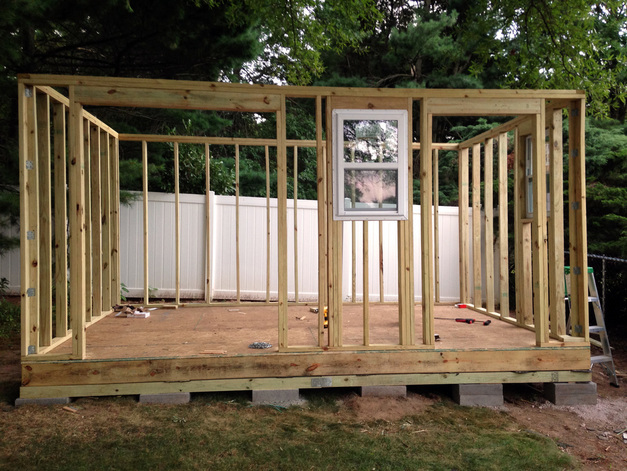 The second part of How to Build a Storage Shed is continued here – Shed Project Part 2 (siding and roof).